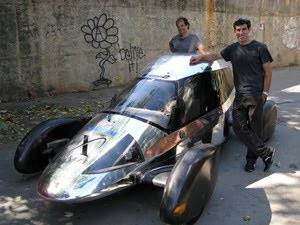 The Automotive X- Prize was launched in 2006-2007 to inspire the creation of the first safe, practical vehicle to achieve 100 miles per gallon. The prize: $10 million. The Edison 2 (top right) achieved an MPG above 100 using an internal combustion engine. It took home $5 million. The Li-ion (middle right) is a hybrid. The X-tracer (bottom right) is battery powered. Because vehicles can achieve their efficiency using different fuel sources, the competition relies on an MPG measure called "MPG equivalent," or MPGe. The denominator for MPGe is created by translating all energy sources used (gas, electricity, etc.) to the energy equivalent of burning a gallon of gas. MPGe has the virtue of allowing one to compare and then combine across energy sources. However, it inherits all the usual problems of MPG--an improvement from 10 to 11 MPGe saves the same amount of energy as the improvement from 50 to 100 MPGe for a given distance of driving. 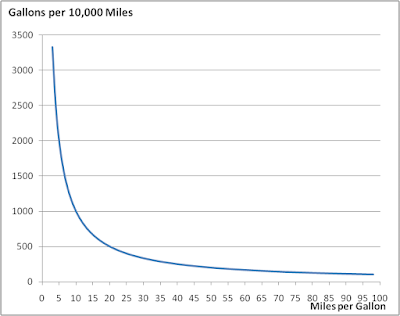 (Aside: A "gallons equivalent" per 100 miles would fix this illusion.) A second fundamental problem with MPGe is that, because it mixes energy sources into a single number, it obscures the cost and greenhouse gas emissions of different vehicles. The highly aerodynamic vehicle has wind-shrouds over its tires and weighs a mere 840 pounds on the road, both of which help it with its phenomenal fuel efficiency (for comparison the top-selling, well-known and supposedly eco-friendly 2010 Toyota Prius manages just 50 MPG--half the VLC's ability). We're particularly taken with the look of the thing. It's by no means conventional, nor is it approaching the sort of design and engineering requirements a real, sale-worthy road-going car would need (although it's got heating, ventilation and passed some of the tests required for a car to go on sale in the U.S.). 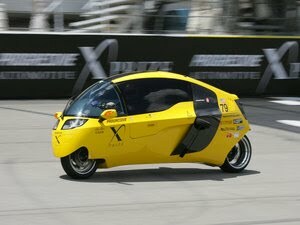 But it looks extraordinary--much more attractive than the odd electric Aptera, with which it shares some design cues. And this, more than anything, helps it promote the notion of alternative power and alternative design in cars which might help more eco-friendly cars race onto the market. "I think these cars are very much in their development stages," says David Champion, Consumer Reports' director of automobile testing. He says car engineers still need to iron out kinks with braking, emergency handling and acceleration. Where are we now that the X Prize has been awarded? What is the benefit of a 100 MPG vehicle? The X-Prize is an intriguing example of using "crowd sourcing" to drive innovation. 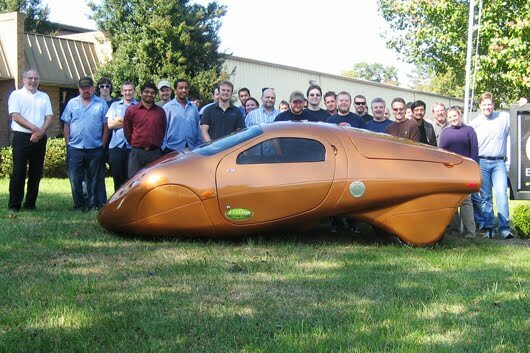 The pursuit of a 100 MPG vehicle has likely stimulated new design and technology ideas that can be used in other vehicles. As the Fast Company article clearly states, however, the winning vehicles are not "sale-worthy road-going" cars. Is there any downside to focusing on creating 100 MPG vehicles? The Fast Company article hints at one problem. According to the article, the Prius is "supposedly" eco-friendly because it is a full 50 MPG less than the Edison 2. 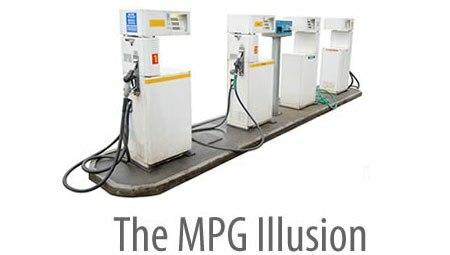 MPG distorts perceptions and priorities. If replacing a Prius at 50 MPG with a 100 MPG X-Prize vehicle is exciting (which saves 100 gallons of gas every 10,000 miles), how about replacing a 14 MPG SUV with a Ford Escape Hybrid -- and saving 400 gallons of gas every 10,000 miles? Even replacing a car that gets 14 MPG with one that gets 20 MPG saves twice the gas of the Prius-to-Edison 2 improvement. But who can get excited about a 6 MPG improvement? Of course it is not either-or. Innovation should focus on both achieving new levels of efficiency on the high end and pulling up the efficiency of the low end. But, when progress on the high end is measured in MPG (a 50 MPG leap! ), it risks obscuring the true value of improvements at the low end.